Paralyzing batters with his fluttering knuckleball, Niekro won 318 games (the 19th player in big-league history to reach the 300 plateau) in 24 seasons with the Atlanta Braves (20 years), New York Yankees and Cleveland Indians despite only winning 31 games by the age of 30, meaning he averaged 15.9 victories a year for the last 18 years of his career! He retired in 1987 at the age of 48. He won 20 games or more three times, including 23 in 1969 to lead Atlanta to the NL West Division crown. He threw a no-hitter in 1973, and in his career, also had one 1-hitter and nine 2-hitters. A remarkably durable athlete, Niekro pitched more than 1,000 innings over three seasons (1977-79). Disdaining vigorous exercise, he spent his free time fishing or dancing the polka. 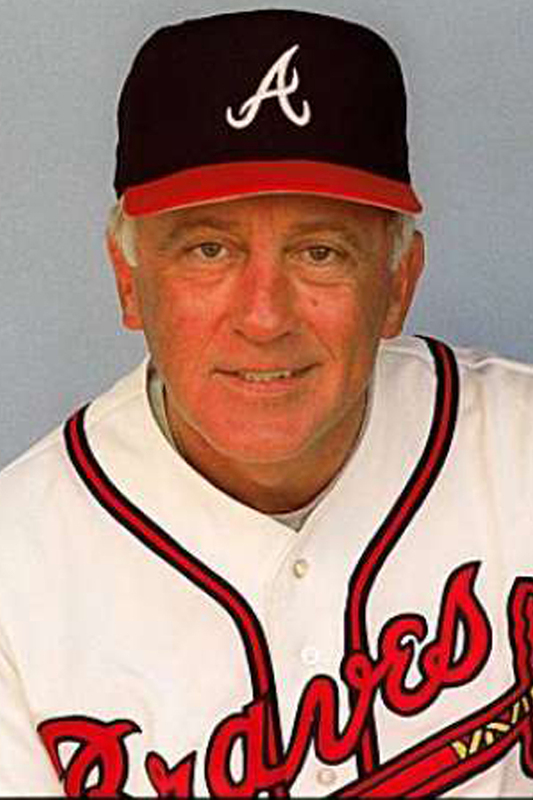 Phil Niekro, master of the knuckleball, usually never knuckled to pressure during his 24-year major league pitching career. Niekro was always easy going and let nothing rattle him as he became one of baseball history’s premier hurlers. He attributes his outstanding success to his personal philosophy. As a result of Niekro’s easy-going attitude and his paralyzing pitch-the knuckleball-he recorded 318 victories against 274 setbacks. He is one of 19 big-league pitchers to win 300 or more games and ranks 12th on the all-time win list. Niekro accomplished his historic feat after only winning 31 games by the age of 30. That means he averaged 15.9 victories a year for the last 18 years of his career! He won 121 games after the age of 40, the only man in major league baseball history to accomplish this feat. At Bridgeport High School, five miles from his home in Lansing, Ohio, Phil played varsity baseball, basketball and, very briefly, football. He played basketball with former Boston Celtics’ great John Havlicek. “The only things I could ever do better than John was catch fish, shoot squirrels and throw the knuckleball,” Niekro laughed. Niekro was quite a prep basketball star and received athletic scholarships from the University of Detroit and University of West Virginia. However, baseball would prove to be his calling. In 1958, he signed a $500 free agent contract with the then Milwaukee Braves. “My greatest thrill in baseball was signing my first major league contract in our kitchen, with my father and mother, my brother, Joe and my sister, Phyllis present,” Niekro said. Nicknamed “Knucksie,” Niekro, a 6-foot-1, 193-pound right-hander, toiled 20 years for usually inept Braves teams. He won 20 games or more on three occasions (23 in ’69, 20 in ’74 and 21 in ’79). In 1969, Niekro finished with a 23-13 record, beating the Cincinnati Reds for six of his wins. With a bit of luck he might have won 25 games, but 8-0 and 5-0 leads were lost through rainouts. 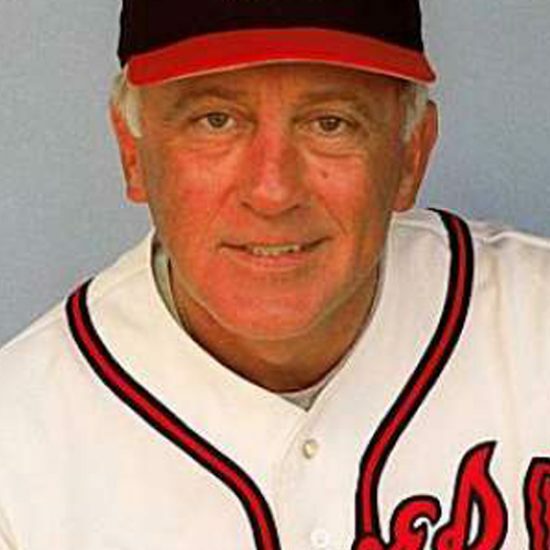 Also, that year, Niekro helped the Atlanta Braves win the West Division of the National League. In the League Championship Playoffs, Niekro set a record he would rather forget. He allowed nine runs (five in the fifth inning) in the opener of the best-of-three-game series to the eventual World Champion New York Mets. Niekro’s best pitch was his knuckleball, which at times had an arc of 10 to 15 feet as it traveled from the mound to home plate. He used this pitch very effectively to record the first no-hitter in Atlanta Braves’ history-a 9-0 win over the San Diego Padres-on August 5, 1973 in front of the home crowd at Atlanta-Fulton County Stadium. He also recorded one 1-hitter and nine 2-hitters in his career. Niekro was a five-time All-Star (four times in the National League and once in the American League), and a five-time Gold Glove winner. The 1982 Braves, who established a major league record by winning 13 consecutive victories at the outset (later tied in 1987 by the Milwaukee Brewers), clinched the Western Division title as Niekro compiled an impressive 17-4 won-lost record at the age of 43! His .810 winning percentage led all Senior Circuit hurlers that year. Niekro never regarded himself as a great athlete, but he was remarkably durable, pitching more than 1,000 innings over a three-year period (’77-’79). The only time he was on the injured list came when he was hit by a line drive while with Atlanta. He disdained vigorous exercise, preferring to spend his spare time fishing or dancing the polka. 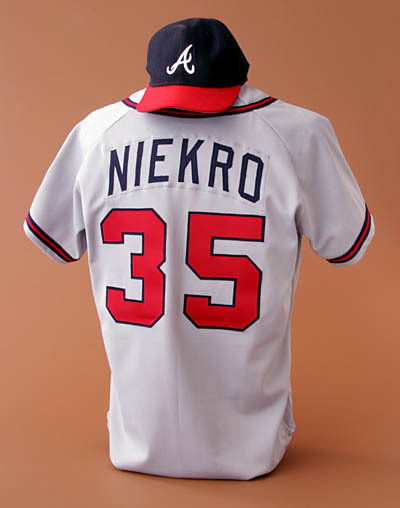 When Niekro was released by the Braves after the ’83 campaign, many people expected him to retire. However, Phil signed with the Yankees and compiled a 16-8 won-lost record in 1984. 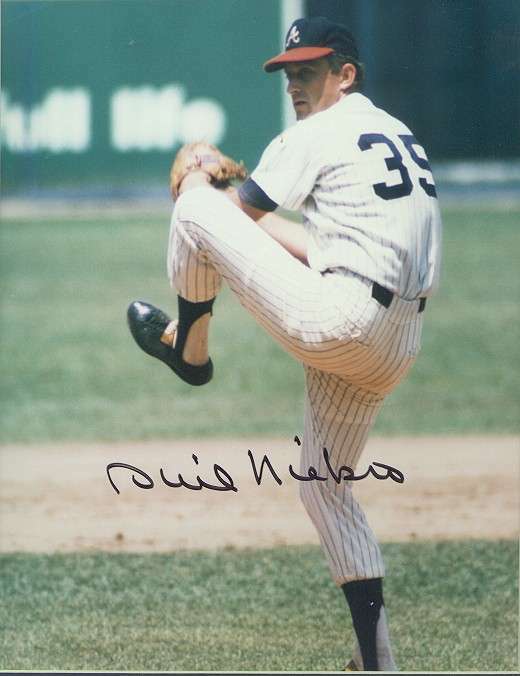 Niekro reached three milestones in 1985. He achieved immortality in the season’s finale by blanking the Toronto Blue Jays, 8-0, for his 300th career triumph, and his 16th victory of the year. At 46, he became the oldest pitcher in history to toss a shutout; and his 16th victory enabled him to become the oldest hurler to win more than nine games in a season. The historic victory was made all the sweeter by having his brother, Joe, watching the game from the Yankee dugout as a teammate. 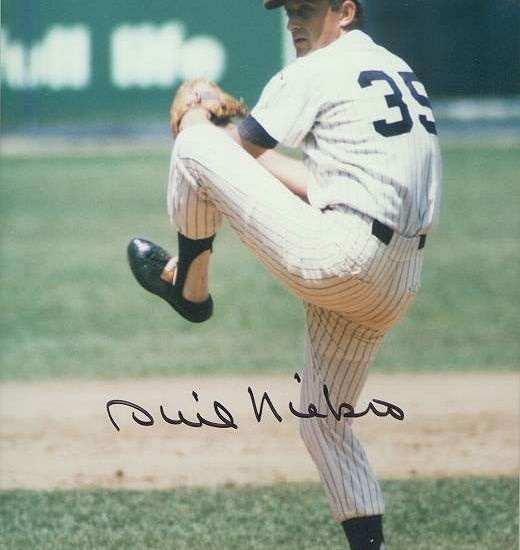 Prior to the ’86 season, Niekro told the Yankees that he’d sign a new contract for whatever they’d offer, figuring that they would give him the $600,000 he received the previous season. Despite back-to-back 16-win seasons, they offered him $380,000. Besides that, the contract was non-guaranteed – he’d have to make the team to earn the money. Phil’s agent wanted him to challenge it, but Niekro stuck by his word. Combined with his brother, Joe, the Niekro brothers won 539 games, more than any brother combo in major league history. In June 1987, Phil, pitching for the Cleveland Indians, tossed a 9-6 victory over the Detroit Tigers. It was the 530th win for the Niekros, breaking the mark of 529 set by Jim and Gaylord Perry. 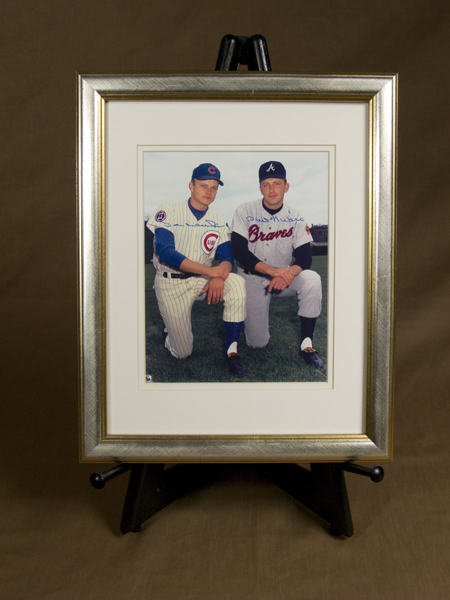 In 1997, Niekro was inducted into the National Baseball Hall of Fame at Cooperstown, New York. Niekro has always been active in community service. He formed Phil Niekro Roasts, Inc. to help raise funds for Spina Bifida, the second most common birth defect. He also has aided the March of Dimes, Big Brothers Association, and the Empty Stocking Fund. Niekro is certainly an individual who has already made a big league impression on and off the field- epitomizing the best that our Polish community has to offer. In 1979, both Niekros won their 21st games on the same day. It was September 30, and they were the only two pitchers in the National League to win 20 that year. Twice – in ’74 with Atlanta and ’85 with the Yankees – they were teammates. Both were knuckleballers (Phil used the pitch a longer time). In games they pitched against each other, Joe had a 5-4 edge, and the only homer he ever hit in the big leagues came off of Phil. Donated $5,000 for a weight room at the Bridgeport High (Ohio) Fieldhouse.